What is the “Third Teacher”? The notion of the environment as “third teacher” and the underlying principles of the educational project in Reggio Emilia will be the conceptual basis that underpins this action research. Creating an environment that acts as a ‘third teacher’ supports the perspective that knowledge is constructed not in isolation but within the social group. Education is often understood as the sole responsibility of parents and teachers, however the educators in Reggio Emilia have reconceptualised the learning environment as a key source of educational provocation and insight and identify the physical environment as a third teacher between child, teacher, and parent. This recognises that children can “best create meaning and make sense of their world through environments which support complex, varied, sustained, and changing relationships between people, the world of experience, ideas and the many ways of expressing ideas” (Muscovitz, 2013). For this research the educational project in Reggio Emilia serves as a source of provocation for teachers who seek to create new contemporary learning environments that support constructivist, learning and teaching practices. The Reggio Emilia narrative begins as a community of parents and teachers living in Northern Italy decide to unite to build and run a small cooperative of schools for young children that promote human rights, and educational inquiry as one of those rights (Malaguzzi, 1998). These schools were the seed of what has grown into an internationally acclaimed approach to early childhood education now referred to as the Reggio Emilia approach (Millikan, 2007). 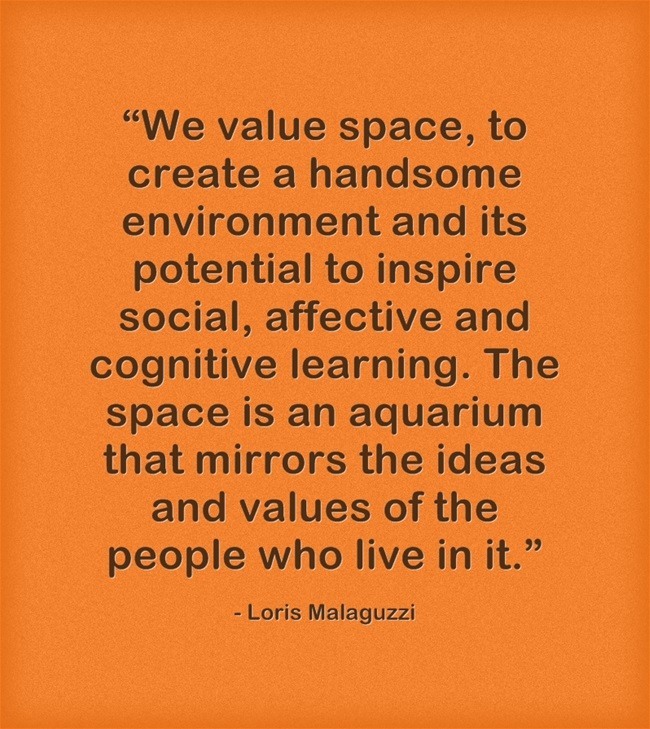 The founder and mentor of the Reggio Emilia approach, Prof. Loris Malaguzzi envisioned Reggio Emilia classrooms as being “transformed into one large space with market stalls, each one with its own children and its own projects and activities.” (Edwards, Gandini, and Forman, 1993, p. 84). The educators of Reggio Emilia view the school as a living organism, a place of shared relationships among the children, the teachers, and the parents. The school produces for the adults but, above all, for the children, a feeling of belonging in a world that is alive, welcoming, and authentic (Malaguzzi, 1994, p. 58). … [school] architecture is not the assembling of spaces, it involves a philosophy, a way of thinking about education, learning, the teaching/learning relationship, the role of action and doing in the construction of knowledge. The school building is a pedagogical project, and, as such, must be the result of careful, in-depth dialogue between the pedagogical and architectural languages. The completed thesis will tell the story of two journeys, overlapping and intersecting, but distinctly different. The first and central journey is an action research project, consisting of a series of action spirals, set in an independent P-12 school in New South Wales, Australia. The second journey, derived from the first, will be the mainly solitary investigation in which I will perform the recognised tasks of a qualitative researcher: reviewing literature, conducting interviews, analysing data, and theorising about meanings. The outcome of this second journey will be my doctoral report. This project will involve regular, on-going engagement throughout 2015 with a range of participants – the school principal, assistant principal, teachers, parents, administration staff in the school and students as they actively pursue inquiry based approaches to teaching and learning in preparation for new contemporary learning environments. This study specifically investigates how the principles of the educational project of Reggio Emilia can support the design and use of a learning environment conducive to inquiry learning, and how these principles may influence teaching practice. I envisage significant aspects of these two journeys will coincide for example, literature surveyed for the school-based project will become part of my thesis literature review, and vica versa. Consequently, I intend on developing symbolic “maps” and travel plans as I progress to assist me to make sense of these journeys and the complex interplays between them. Like many travellers, I intend on taking “snapshots”, literally and metaphorically, of events and encounters. My intended travel “diary” in the form of a blog will contain detailed journey entries of feelings, perceptions, conversations and encounters and analyses of situations, problems and opportunities. I also plan to keep “mementos” in the form of transcripts, email messages, letters and invitations as reminders of events and experiences. I intend on embarking on writing a story of this journey using excerpts from these “travel documents”, coupled with understandings gained from researching the “guidebooks” of relevant literature and from learning about the research journeys of others. The “travel report” will be my final thesis, a personal account that will facilitate the development of my “living educational theory” and that will help me reshape and refine my knowledge, beliefs and values about teachers and students as learners, educational change and the potential of learning environments. • How can the principles of Reggio Emilia support the design of learning environments conducive to inquiry learning? • What influences the design of learning environments? • What learning environment design elements hinder or enable a teacher’s ability to adopt inquiry based approaches? • What professional learning opportunities and needs do teachers have that enable their use of newly designed learning spaces?